When times get a little tough it’s easy to spot that you are not the only one going through it. just watch TV. The state of society is reflected back at you. If you are finding it hard to make ends meet you might wonder about how we made it through the world wars and the decade of rationing that came after. Bomb Girls, Foyles War back in a new series after a two year haitus, Call the midwife, Dancing on the edge, the list goes on. There is the BBC ‘reality’ programme Wartime Farm. It’s a cliché but the list is endless indeed, especially from the Brits and the Canadians. Money is tight, unemployment high, and there is high nostalgia for simpler days when “Make Do and Mend” was a universally known concept. We grew up in short pants, and didn’t earn our first pair of ‘longs’ until we were thirteen. No one went “Yuk” or laughed when we walked down the street knawing on a jellied pig’s trotter. They were the popular equivalent of hamburgers. How astonished was I recently when I visited some new young friends, Kevin and Vicka? The answer is very. Very astonished! These two young ‘twenty-somethings’ have embraced the new rage taking off in Australia. They call themselves BLOOMERS. Vicka describes BLOOMING as ‘living within the means and lifestyle of an era.’ Kevin and Vicka want to get married in five years. And they want their lives to have meaning. ‘We want children, and our own home, and we’re tired of being called a welfare generation. We chose the wartime generation, when the baby boomers were being born, but there are BLOOMERS who choose to adopt a mix of modern and 50’s or modern and 60’s. We still have the microwave, and our computers. We’re not purists. It’s about integrating the best of one period with the best of another and by learning from the best of the past, saving for our future. We’re not throwing the baby out with the bathwater. We’re just finding a way to live independently in a simplistic, healthy way. Vicka invited me to have dinner in their big shared house in an inner Sydney terraced house. The entire meal was replicated from World War 2 recipes and cost Vicka a total of just $18 including wine and desert. There were eight of us for dinner, and the whole thing was prepared faster than it took to order and deliver take-away pizzas. Unlike some, Kevin and Vicka did not embark on their Bloomer lifestyle through any rigidly held ideal. ‘ I was given some dvd’s ‘ Kevin recalls. ‘I was studying the period of the second world war and its effects on the baby boomers, and initially it was just study. My grandparents are great story-tellers and even though it was wartime, they seemed to have such happy times. They never judged us for mooching off our parents, and our parents never begrudged us anything. But you get to feel that if you don’t do something, become independent, there is not much of a future for anyone is there? Vicka chimed in. ‘Our food and living expenses after rent and utilities was $420 a week and we were still going backwards. We couldn’t see how our future was going to get any better. All our friends were in a similar situation. Most of them even worse with maxed out credit cards. We’re not exactly Ludites, but really, for us it all started out with a pen and paper trying to figure out how to cut our living expenses and stop living off our folks. ‘As we’ve continued blooming over the past eighteen months,’ Vicka says, ‘one of the things that has surprised me most is that you would think that saving lots of money would result in having less time to ourselves, but it hasn’t turned out that way. We’ve got our weekly expenses down from $420 a week to $280 with no real effect on our time. Of course we spend our time differently now, because we enjoy getting together with other bloomers. We’ve got friends who live the 50’s lifestyle and we take some ideas from them, and share our own with them. There’s an old couple down the road. They’re like, 70 ish and they live like people did in the 1930’s. ‘And our kids.’ Vicka has that look in her eye. 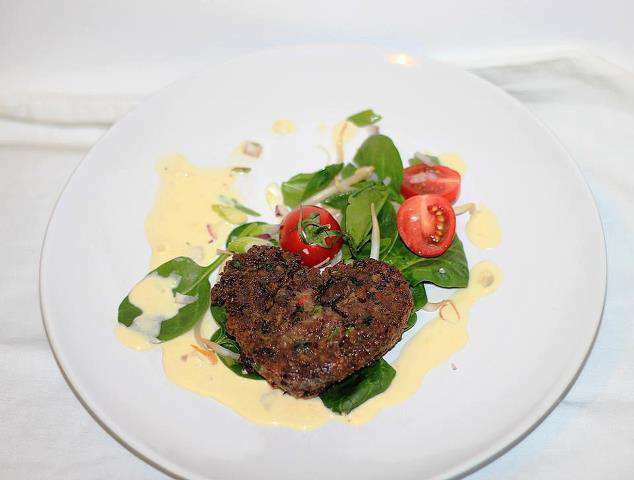 This is Vicka’s recipe for Liver Patties with Creamy Onion Sauce. The main course of the dinner. As a Baby Boomer I have to say that there is a new generation blooming. And I like it. Drop liver slices into boiling water and let steam 3 minutes This will loosen up the membrane and thick veins which you should remove. Cook onions in butter until soft.Sprinkle flour over them and stir until blended. Add milk, and cook over moderate heat, stirring constantly until sauce boils and thickens.